this page is under constructions --- all the pictures are not yet finish to be posted. Fill-in the new growth at the base on the client's base. 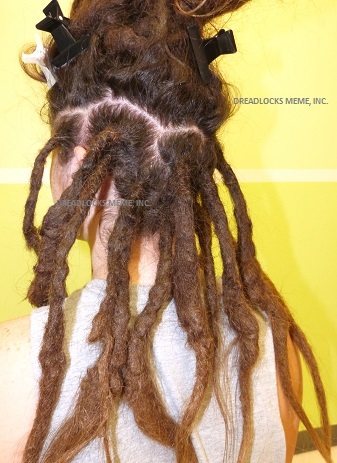 We do this type of Dreadlocks Services, only when there is a lot of new growth on the base of that actual locs and there isn't enough loose hair around that particular locs to tighten the base. In that case we use the natural hair of a relative or an A.K.H.H. to tighten the base/roots. This client she is 17 years old. 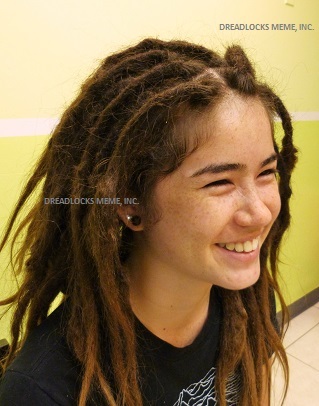 All minors should have their parent (s) or guardian's permission before any Dreadlocks services can be provided. 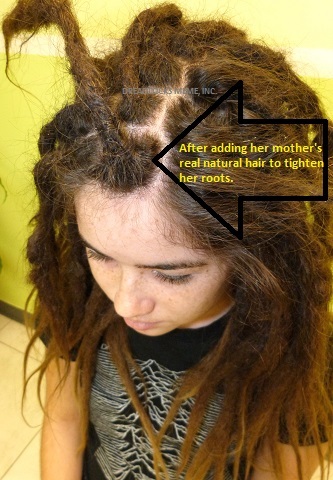 She has a lot of new growth and it was not enough to tighten her base of the locs. 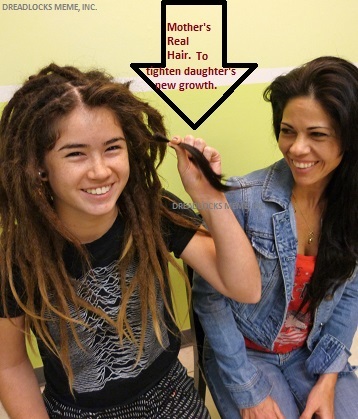 In that case we need an additional loose hair to tighten and fill-in that area the new growth at the base of the loc. 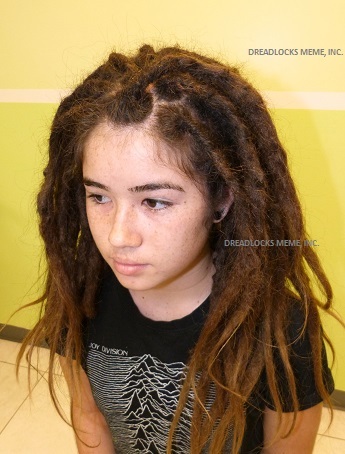 This client was fortunate to have her mother willing to cut pieces of her hair for Meme to use at the base for this particular Dreadlocks service. In the picture above you will see the client, which the daughter of the young lady who has the black hair color. You may asked --- Will her mother's colored hair will show on the daughter's light brown hair color. 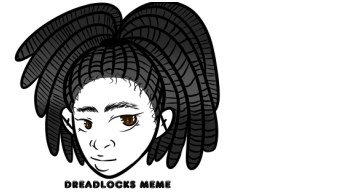 Well it has to be tighten inside of the base of that particular locs and use an out of layer of the client's light brown hair to finished the tighten process. That technique will help to hide the black hair color. Happy moment after mother let her daughter cut off a piece of her hair, to use for the daughter's fill-in and the tighten services base/root of the loc. The hair is parted to gather all the loose hair around that particular loc for the fill-in and tighten of the new growth at the base. 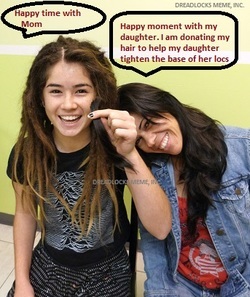 The piece of the mother's hair is being C.N. into the daughter's new growth at the base/roots. 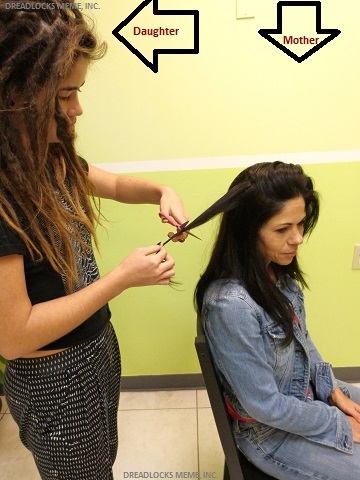 The reason that is necessary for this process, is because client left her hair grows for about six months without getting it tighten at the roots. 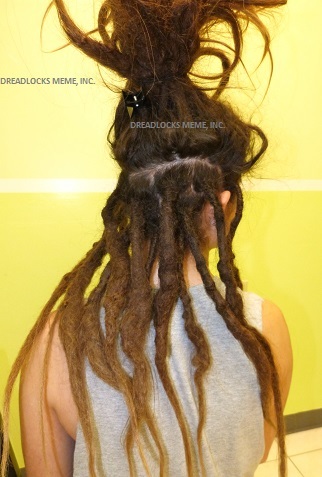 She did was her locs about 3 times a week without getting them tighten. 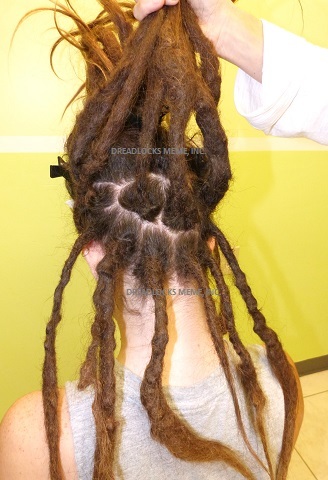 For Example: Let's say client tighten her locs every 2 to 3 months this process is not necessary to do. We only add hair when there is a lot of new growth and not enough loose hair to use to tighten the roots. You will see one side is done with the fill-in and the tighten and the other side has a lot of new growth. We show you this picture therefore you will be able to see the before and after the fill-in procedure.